Snadboy's Revelation (v2.0) can be a really handy program to have. This program will uncover passwords hidden behind asterisks and allow you to recover those passwords which are saved, but you just can't remember. The program is older, but nevertheless still useful. 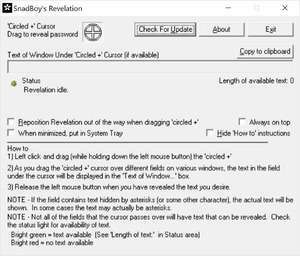 For security reasons, you should also check out the Revelation download at LO4D.com which includes virus and malware tests. Additional screenshots of this application download may be available, too.